The “No String Attached” adventure from Wyrd Games offers a great basic concept, but it is specifically created as a 1-shot and due to that is was rather short and missing some aspects I wanted to add. 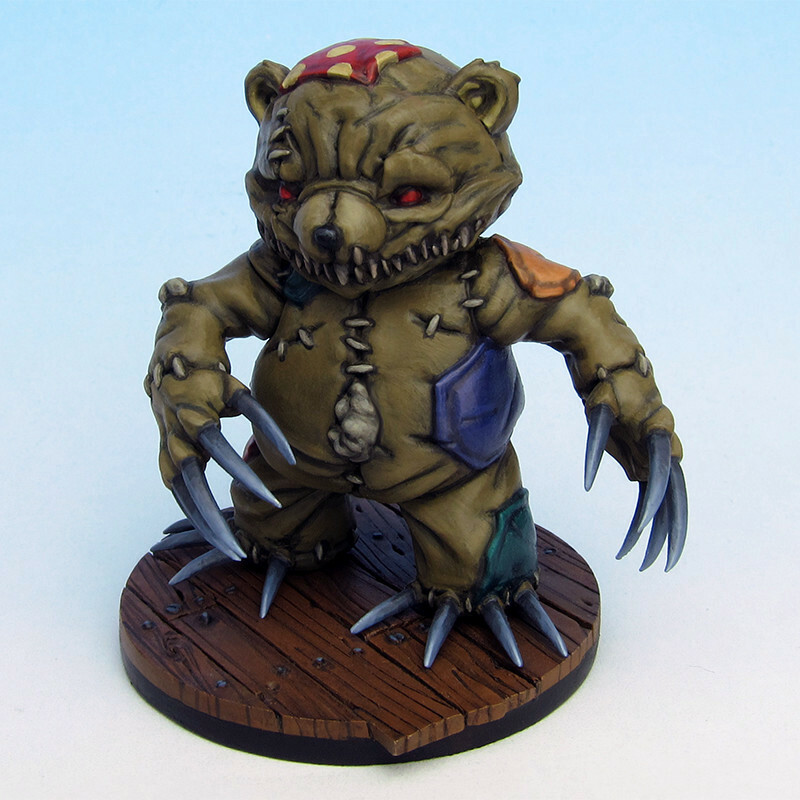 One was the lack of a big boss fight and when I first saw the 2014 GenCon limited edition of Malifaux’s Teddy, “Miss-Ery”, it felt like a natural fit. The model looked like it was made for Puppet Wars, and its large size made it an imposing boss model. The only problem was getting my hands on the limited eidtion model. It took me months of scouring the web until an eBay auction for the model popped up. Luckily I was able to win the auction and immediately after receiving the model I painted up “Misery, the original Voodoo Puppet”. The swamp witch doesn’t quite remember how many years ago she animated the first voodoo puppet, but of course she remembers which puppet it was, she created first – Misery, the Nightmare Teddy. Among today’s puppets Misery is not much more than a myth. No living puppet has ever seen the first of their kind, only heard stories passed down by old puppets long deceased. Misery spends her days sleeping in the witches bed, dreaming sweet dreams of slicing open other puppets with her razor sharp claws. Legend says only great violence could wake her from her slumber. Violence like dozens of puppets meeting on the battlefield maybe? This entry was posted in New Minis and tagged Malifaux, Puppet Wars, RPG, Wyrd Miniatures by Grey. Bookmark the permalink.